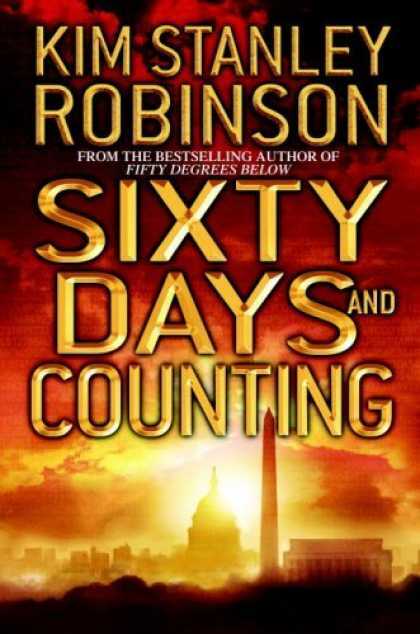 Sixty Days And Counting is the third and final novel of the Science In The Capital trilogy, published in 2007. A new administration arrives in the White House, decided to tackle climate change in every way possible. Personal destinies and global strategies are forged. It follows the efforts of the main characters to combat climate change as a new presidential administration is elected in the White House, and at the same time to find inner peace. Like all three volumes in this trilogy, the novel is divided in ten parts. Each part begins with a short incipit (in italics), often unrelated to the main characters and told from a different or omniscient point of view. The part then contains short chapters, each focused on one of the main characters (essentially Frank and Charlie) and narrated in the third person. Each chapter thus follows a storyline that develops simultaneously with the rest of the part’s chapters and narrating the evolution of the relationships of the ensemble cast’s characters. Sixty Days And Counting continues the second volume’s increased focus on the character of Frank. - The Dalai Lama, November 15, 2005, Washington, D.C.
Change is apace. Phil Chase has been elected President of the USA and promises to make good on his promise to take concrete action against man-made climate change. Chase convinces Charlie to join him in the White House for help in drafting environmental legislative packages. In his inauguration, Chase speaks of “the government of the people, by the people and for the people”, global cooperation through the UN, women’s rights and population stabilization, environment and social justice. The new administration settles in and their Things To Do list in the first sixty days of term is huge. A climate change task force is established, Diane Chang is named the President’s science advisor, and Frank, in the advisory team, is on the front line in the effort for a push to clean energy (notably via solar power). Anna declines the offer to join Diane’s team, she prefers science to policy, however the occasionally helps through FCCSET (Federal Coordinating Council on Science, Engineering & Technology) or OMB (Office of Management & Budget). It is evident that a Manhattan Project/New-Deal-like push is the way forward: what is necessary is actually not technology R&D, but time and money. In the Hobbesian struggle between agencies and against Big Oil lobbies that ensues, Diane is conciliatory and asserts her power, and Anna shines with her intelligence; Frank admires both women. New photovoltaic panels are installed on the White House. Part of power generation is nationalized to remediate the power cuts and the Navy eagerly enlists her nuclear fleet to serve as emergency generators. The Air Force looks at partnerships with NASA to develop space-based solar power. Terraforming Earth becomes a matter of national security, and with the military and their subcontractors at disposal, a huge budget becomes available. Frank further works on funding proposals to take oil out of transport (biofuels) and power (carbon capture and storage), to have more farmers adopt sustainable agriculture, to materialize mitigation projects. The Gulf Stream has been restarted, but the West Antarctic Ice Sheet has detached. Kenzo and the climatologists fear that seawater circulation has changed so much that climate has moved beyond their comprehension. With the re-insurance companies, Frank and Anna investigate pumping excess water to the Sahara or up Antarctica to stabilize sea level. In a meeting between IPCC and the World Bank, Charlie despairs at the radically different worldviews and finally loses it, harshly criticizing the World Bank for the externalities unpaid for and their profiteering stance posing as false development. Frank pays a visit to the NSF’s Regional Research Center in Climate and Earth Sciences (RRCCES, or ‘recess’) he helped set up in San Diego and hangs around with Yann and Marta, with whom the underlying sexual tension never ceased. However he is disgusted at the artificiality of modern merry-making when Marta feeds him an ecstasy/Viagra mix in a night club. Frank tells Edgardo about Caroline and her husband, agents in a secret unit of R&D Agency Prime, one of many in the net of secret intelligence agencies that have ceased giving accounts to the governmental bodies from which they sprang. Caroline, spooked by her husband Ed Cooper, has vanished. With the help of Edgardo’s friend from his DARPA days, Umberto, Frank tracks down Caroline’s location and drops for a visit in a lovely cottage in Mount Desert Island, Maine, where they learn more about each other. But despite their best efforts to de-bug their effects and stay off the grid, they are discovered and have to flee back to Washington. Edgardo and Umberto work on their contacts to track down Cooper’s black ops team and coordinate with Caroline to trap them, while keeping Frank out of the loop. In their next meeting, Caroline’s worries have increased and she activates her Plan C: she hides in the area and takes another identity entirely, and sets up a drop point in Rock Creek Park for exchanging messages with Frank. Frank has sleeping problems and starts really worrying too when he finds his old treehouse destroyed and his kayak sabotaged... He increases his attempts to drop off the grid as well, trying to be visible only when at work. He goes hiking in the park after work, befriends with the Bros, who are back after the rough winter. He joins the fregans -- this mix of neo-hippie and post-punk, the most extreme set of habits Frank has adopted so far -- in their restaurant dumpster diving teams, spends the night in fregan-occupied abandoned buildings and every few nights moves places. He gets an old VW van in which he sleeps, stops using credit cards and mobile phones, uses internet only in the office. Work is the only thing constant in his life. Drepung, Frank and Charlie go on frequent kayaking trips in Rock Creek Park. Frank inquires Drepung on whether he really believes in reincarnation; Drepung comes to admit that it’s like a metaphor, that we can live many incarnations in a single lifespan. Inexorable change. With his Mr Dad days over, Charlie settles in in a new routine, with work in the White House and Joe at the White House Gymboree. Since the ceremony performed on him, Joe is calm; too calm and too accepting for Charlie’s liking, actually, perhaps a part of growing up, perhaps not. Anna is also worried about what seems to be a chronic fever Joe has, scientific worries unlike Charlie’s metaphysical ones. Rising oil prices and multiple power failures urge the Quiblers to re-shape their daily lives; this means more gatherings in the living room before the lit fireplace, little adventures of their own that end up being enjoyable after all. Nuclear military submarines are coupled to the electricity network to provide power during failures. Fewer groceries in supermarket shelves. Anna looks into shortage economics and forced adjustment equilibrium. They get satellite phones to communicate during blackouts; they install garden beds and go at it despite their lack of experience in gardening; they ration their water and energy consumption. Frank often takes Nick Quibler with him on treks throughout Rock Creek Park, spotting and darting tracking chips in the feral animals out there. Anna has Charlie invite Frank to Charlie’s yearly backpacking week trip with his old UCSD friends, in Owens Valley, in eastern California. They set out at dawn, come across evidence of a glacier and a Native American summer shelter; they camp under the starry night; Frank hardly talks, is relaxed; each is in his own little world, observing the landscape, and occasionally they all sing together. Charlie asks Drepung to do another ceremony to bring the ‘old Joe’, what he believes to be the Bön spirit they mistakenly dispelled earlier, back. After the ceremony, which involved candles and saffron, dancing and chanting, the old lively Joe seems to be back. In the daycare center, Joe makes trouble, hitting kids, cursing, and Charlie’s satisfied to see him as lively as before! In the spring, the Khembalis move to a more spacious farm, in Maryland: their new Shambala. Chase is actually helping them as promised! They build a large treehouse after Frank’s design and Frank and ageing Rudra move in one of the rooms. Frank is still worried about his brain damage and what he perceives to be a lack of capacity to make decisions. He is diagnosed with a subdural hematoma; however he’s unsure whether he wants surgery to relief pressure on the brain or if he’s OK with the changes after all. He reads a lot of Emerson and Thoreau, has walks and talks with Rudra and still goes frisbeeing in the park. With Rudra they establish the two good correlations that would reduce mankind’s load on the planet: prehistoric life style with happiness and health; and social justice with population growth. Then Rudra dies, and Frank decides to go ahead with his brain surgery. The Khembalis hold a ceremony to recognize the Maryland farm as the current manifestation of Khembalung. The Chase administration also attempts to grow close ties to the Dalai Lama while simultaneously keeping negotiations with China alive. Dalai Lama visits Washington and in a ceremony involving passing scarfs to representatives of all Tibetan communities that recognize Dalai Lama as their spiritual leader, Drepung is among them. Later, in a kayaking trip with Frank and Charlie, Drepung confides them with his story: he is the true Panchen Lama, persecuted by the Chinese, and now with diplomatic immunity, taking part in the delicate US-China talks and with Phil in the know and sympathetic. The Frank principle, “saving the world so science can proceed”, is basically adopted by NSF. Thanks to Frank and Charlie, Diane and Phil organize a meeting; soon they partner together. With China, Holland and England endorsing the program, the seawater relocation projects begin; pipes are taken from oil and gas pipelines; PV panes power up the pumps. Anna looks at China: the environment is disregarded before the importance of economic growth and the Chinese Academy of Sciences does little more than observing and worrying of a ‘general system crash’. When massive droughts lead to an ecological chain reaction in the Yangtze and Yellow River headwaters, massive ecosystem collapses ensue and the Chinese call NSF for help and expertise. Phil frequently blogs his thoughts. He sees uneven development in the world as a big opportunity to channel capitalist efforts, to use environmental projects on a regional level as a new driver for development; and eventually the process will mutate capitalism into something else. Frank takes a trip around the world. In San Diego, Frank is satisfied with himself when he avoids Marta’s flirty entrapments. In Beijing, he visits a Carbon Expo, where China is perceived as a threat that tests US’s willingness to make deals. In Talka Makan, a wall is built around the archeological dig of ancient Shambala (and Frank releases the last of Rudra’s ashes) as the basin is flooded by the construction of a dam. In Siberia, the genetically modified carbon-capturing lichen has had an enormous success, it is in fact out of anybody’s control and who persuaded who between Russia and Small Delivery Systems to go ahead with the experiment is now irrelevant. In London, in a conference on the Thames River Barrier, Frank is frightened by the confidence of the younger generation on mankind’s terraforming capabilities. Frank gets those close to him to read Emerson, even Phil. Emerson and Thoreau really were 19th century American radicals. And it could not be otherwise that Phil Chase, a bold president, would get shot. He survives the assassination attempt and when he recovers, Charlie finds him still with his everything-is-politics approach but more serious, intent, with a new contained anger, willing to test the limits of the system. Phil sends out a volley of new legislation to pass, he adopts an ‘either vote for or be an obstacle’ attitude: more radical, but these things had to get done: fuel mileage efficiency, gas tax, WHO population stabilization, gun control. He blogs that health care for everyone and full employment is well in their capabilities, that alternatives had become unthinkable so thoughts of change were dismissed, that faith to blind hand of the market was a collective illusion. He talks with Charlie about F.D. Roosevelt, the New Deals, the creation of the UN. The crisis in China explodes and Phil and the UN go there. A deal is passed with the Chinese: the US will help with environmental and technological expertise and will provide power (with US nuclear submarines feeding to the Chinese network) while China switches to clean power, and China will agree to cap carbon emissions and draw the rest of Asia to a cap and reach a compromise with Tibet. Phil blogs: social justice the best way to go forward. There is a need to stop the stupid imperialistic attitude of America, a need for a new vocabulary to call things, a more even distribution of capital. Permaculture: a job, a shelter, health care, education, rights for everyone. A crux in history. Umberto, part of the General Accountability Office (GAO), gathers evidence in his persecution of Ed Cooper’s group, which has gone underground since Chase’s assassination attempt. Phil and the GAO come to Frank to talk about their seriousness in cleaning up the intelligence agencies (Phil being unaware of Frank’s role in getting him and Diane together!). Frank and Caroline are the bait: they stage an exchange of information on the election voting machines tampering, knowing that Cooper’s team were monitoring them; Cooper and his team resurface and the GAO arrests them. After the debriefing, Frank and Caroline consider their options: they choose the witness protection program, new names, new identities, in San Diego. They visit San Diego, Frank looks at job opportunities in biotech firms, Marta and Caroline appear to like each other, Frank and Caroline consider buying a house in Leo’s neighborhood. Caroline announces she’s pregnant. Charlie believes he should concentrate more on Joe’s upbringing and asks Phil to let him work from home again. Phil accepts reluctantly; Charlie says he may be back in the White House for Phil’s next term. Everybody gathers for a Khembali party, celebrating the Dalai Lama’s return to Tibet -- and even the Dalai Lama himself drops by! Drepung leads the three couples through their marriage vows: Frank & Caroline; Phil & Diane; Roy & Andrea (Phil’s staffers). Frank makes partings with the Quiblers and promises to keep in touch. The Khembali treehouse is growing and Sucandra offers the Quiblers to move in with them (also considering that the energy consumption would be much smaller than in suburban house). Cutter, from the Bros, comes to the Quiblers’ and installs PV panels on their roof; Anna wants to cut their carbon burn even more and they consider Sucandra’s offer. Charlie considers his frantic life since the birth of Nick, a series of thens that for each he thought would last forever, but none do. Frank makes a last kayaking trip in the Park; he sees the woman kayaker he’s been trying to reach to for ages, but once again she’s too strong and Frank is unable to catch up with her. Frank comes back to picnic with Caroline, his love. Frank Vanderwal: In the team of the science advisor's to the President. Lives with Rudra Cakrin in the Khembalis' house in Arlington. Anna Quibler: Director of Bioinformatics Division at NSF. Charlie Quibler: Environmental policy advisor to the President. Phil Chase: Newly elected President of the USA. Diane Chang: Newly appointed science advisor to the President. Caroline Churchland: Ex-surveillance agent of an agency gone rogue, now on the run. Drepung: One of the Khembalis that has moved to Washington; in fact the true spiritual and political leader of the Khemablis. All the repetitions in the pattern were superficial; the moment was always new. It had to be lived, and then the next moment embraced as it arrived. Andrew Leonard - Salon.com: "The anti-Crichton"